Sir George Monoux College strives to support students during their studies here, in order for them to progress to university and/or employment. All College staff hold high expectations for students and encourage them to achieve their full potential. Over 600 of our students progress to university every year, with a high proportion going on to graduate from Russell Group universities. Our 2015 leavers received a record number of Russell Group university offers. Our students secure university places at over 75 different universities across the United Kingdom and worldwide. We work closely with parents and guardians throughout the academic year to ensure clarity, communication and expectations. We hold a Higher Education Parents Evening, in which parents and guardians will be able to find out more about the university application procedure and the important issues regarding finance at university. We also hold a Parents' Induction at the start of each academic year, to give parents an insight into college study and how they can support their child's journey to success. 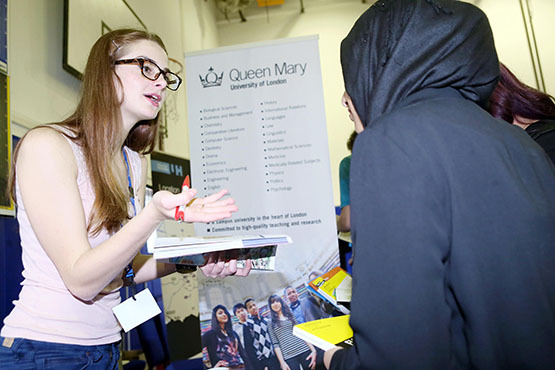 HE and Careers Day, with over 100 universities and employers visiting the College to run academic sessions, offer advice and provide invaluable networking opportunities. The Nuffield Bursary Scheme, which allows students to carry out their own scientific research project with university academics. We work with a wide variety of universities such as Oxford, Cambridge, King’s College London, Queen Mary, UCL, LSE, Westminster and Southampton to name but a few. We have developed close partnerships with institutions such as University of Leicester, who offer our students a number of scholarships; and London Metropolitan University, who run a mentoring scheme. Students will also have the opportunity to gain a University Recognition Award in partnership with Middlesex University for those who show potential to become excellent undergraduates. Our links with universities means you will be able to partake in initiatives run by academics and staff from these institutions, including university mentoring, academic masterclasses and tailor-made educational visits by academics from a range of disciplines.